This mural is actually 2 murals on either side of some big double doors, one side in the mexican food restaurant, Sophies, and on the other side, a liquor and snack store, right across from the Imax Theater in Tusyan, just outside the park. 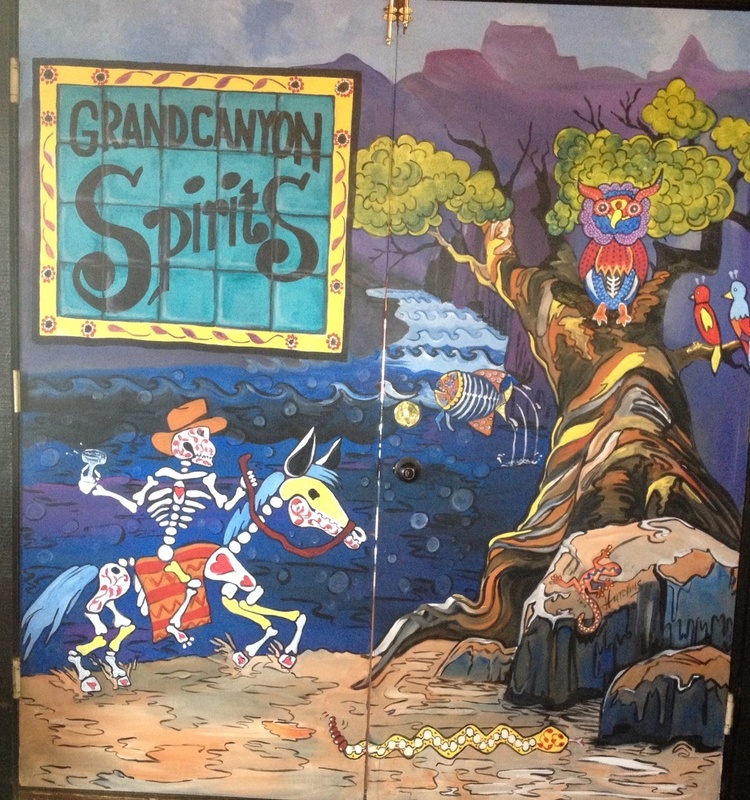 The name of the store is “Grand Canyon Spirits” and my client wanted a sign saying that on both sides. I was given carte blanc to do whatever I liked (easy client!). I decided if I had to have a sign, this would be the title of both murals. On the Mexican food side, the theme is spirits of past, as depicted by the shapes of “spirits” in the clouds, rocks, sky…all over. The present is represented by the mule and the couple with the baby on the man’s back wandering along the trail. The future spirit is in the obviously pregnant woman. The mural on the flip side of the door is a Day of the Dead theme. Spirits of dead stuff. 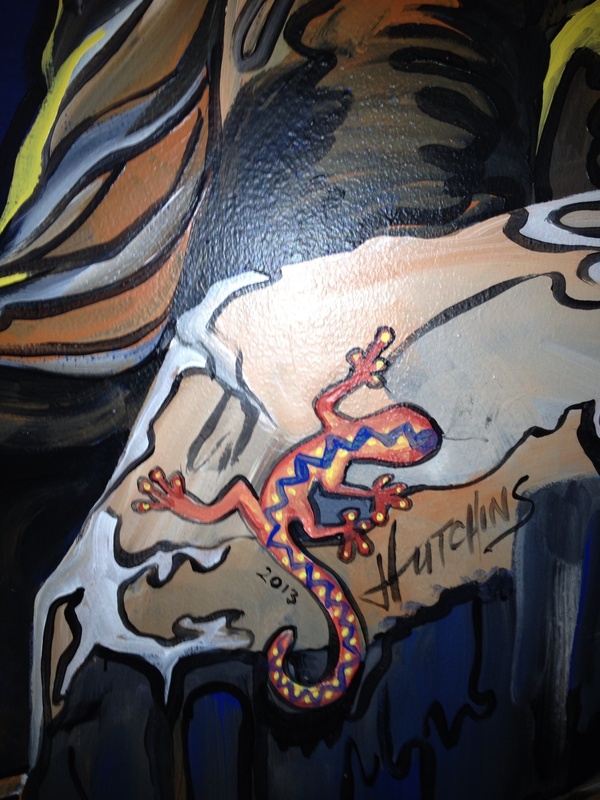 My fave part of it is the tree, which was inspired by fellow Grand Canyon/Northern AZ artist, Shonto Begay. The basic shape of the canyon and river was inspired from a photograph taken by Mike Buchiet (sorry about the spelling Mike, I will correct it in the next edit!). 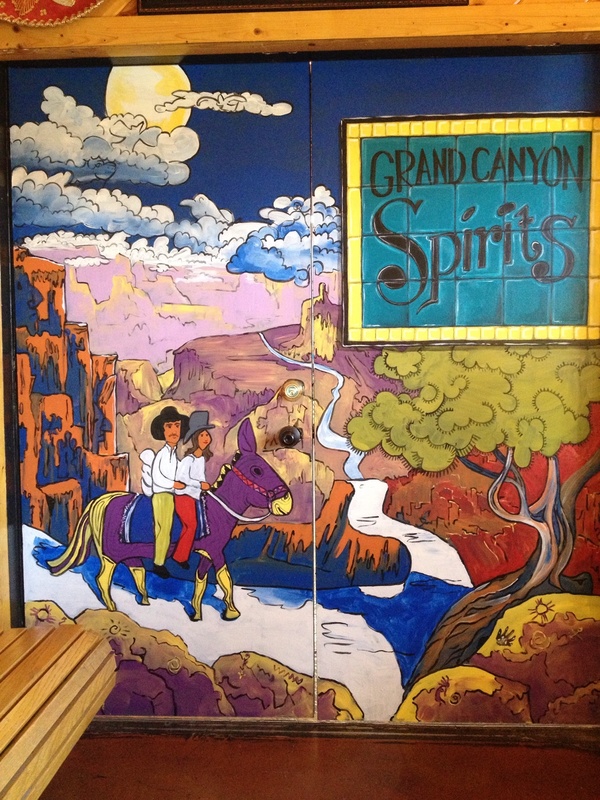 The “tile” Grand Canyon Spirits” signs were inspired by Tuscon tilist, Carly Quinn. I love how she gets texture in her tiles and how the light reflects that.